H stands for Honour, a word they’ve forgotten. L is for Loos, where the Germans did fly. M is for Mons, where some thousands fell, N for our Navy- where? No one can tell. P is for Privates who follow their lead. T for the Turks who’ll soon be in slavery. Z is for Zeppelin, whose visits must cease. 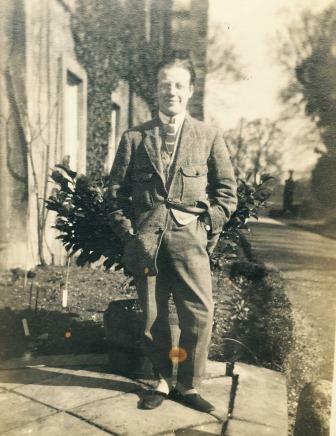 Thursday 30th December 1915: The funeral took place at 1pm today of Mr. Samuel Whitbread, D.L., J.P., who died at his residence at Southill Park early on Christmas morning at the age of 85. The church at Southill was filled to capacity for his funeral. 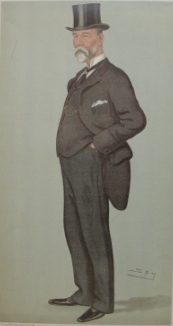 Mr. Whitbread was associated with the brewery which bears the family name from 1867 and in 1889 became chairman of the company. He served as the Liberal Member of Parliament for Bedford for forty-three years from 1852 until his retirement in 1895. Locally he served as Chairman of the Governors of the Harpur Trust and of the Bedford County Hospital, to which he was a great benefactor. He took a great part in administrative affairs in the county and was at one time an Alderman of Bedfordshire County Council. 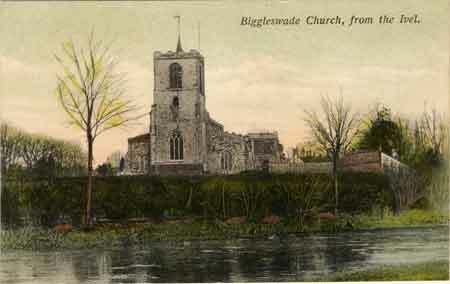 Of great importance to the county was his role as Chairman of the Biggleswade Water Board in providing an excellent water supply for Biggleswade and the surrounding parishes by sinking a well in the greensand from which supplies are piped as far afield as Kempston. He continued to be active in local affairs until a few years ago when advanced age and deafness forced him to retire. Wednesday 29th December 1915: The family of missing soldier Percy Gambriel are continuing to make enquiries in their efforts to trace him but this are still proving fruitless. They have contacted the British Red Cross, the Bureau Zuricois pour la Recherche des Disparus at Zurich, and now the Prisoners of War Help Committee in the hope that he may be a prisoner of war. Unfortunately from their reply it seems unlikely that this is the case: “The Committee beg to say that they regret they are not at present in possession of any information in regard to the person about whom you enquire, as being a prisoner of war, but should any news be received, it will immediately be communicated to you”. For another family the news of their missing son is grim. Private Arthur Emmerton of the 2nd Bedfords, aged 23, was last heard from by his parents on 23rd October 1914. It was thought that during the hard fighting which took place at that time he was separated from his comrades and taken prisoner. However, nothing was heard of him and on November 11th 1914 he was officially reported missing. Mr and Mrs Emmerton of Bedford Road, Kempston, have continued to make enquiries to no news of their eldest son has been received. The War Office have no written to them stating that “the Army Council have been regretfully constrained to conclude that Private Arthur Emmerton, 2nd Bedfordshire Regiment, is dead”. Tuesday 28th December 1915: Letters of thanks have been received by Mrs. William Kendall of Millow Hall, Dunton, for the useful parcels she sent as a Christmas present to each of the Dunton boys who are serving at the Front. This generous lady also provided a welcome gift of one hundredweight of coal for each of the eleven widows in the village. Q. 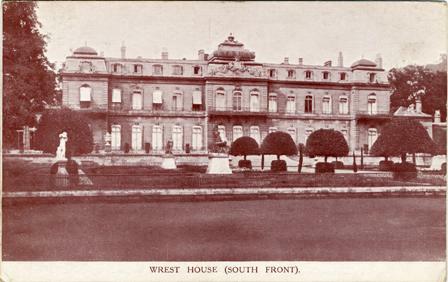 Why is Wrest Park Hospital like the army?A. Because it takes some beating. 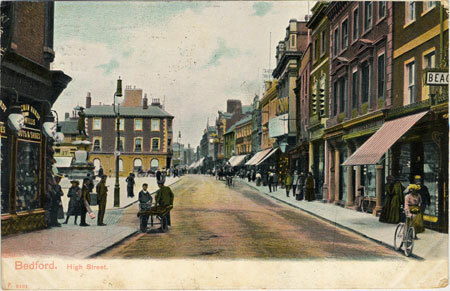 Sunday 26th December 1915: After an unseasonably wet day yesterday Bedford is enjoying bright weather for Boxing Day. Troops billeted in the town spent their Christmas at the Central Recreation Room in the Corn Exchange where they enjoyed an excellent Christmas buffet and a lavishly decorated Christmas tree supplied by the Duke of Bedford. Gifts subscribed by local residents were distributed to the soldiers by Father Christmas (impersonated by Mr. W. Machin). Games were played and the Mayor gave a short speech. Ladies canvassing for subscriptions for the Serbian Refugee Fund have been busy over the Christmas Season. The Mayor, Mayoress, and Miss Hockliffe were “at home” in the Town Hall on Christmas Day to receive subscriptions and will be there again tomorrow and on Wednesday. Tables at the Town Hall have been decorated with ornamental plants by Messrs Laxton Bros. Tonight an entertainment and concert will be given at the Sergeants’ Mess of the Bedfordshire Battalion Depot for wives, families, and friends of Staff-Sergeants and Sergeants serving both at home and abroad. They promise a memorable evening in keeping with the traditions of the Bedfordshire Regiment, which in this war as in the past “has proved itself second to none in upholding the honour and glory of an Empire upon which the sun never sets”. 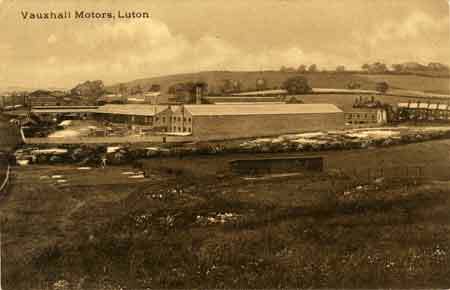 Wednesday 22nd December 1915: Following a series of thefts Vauxhall Motor Works brought a prosecution against an employee at today’s Luton Borough Sessions. Mrs Emily Clark of Hitchin Road is a mother of four and the wife of a soldier who has been pensioned out of the Army due to extensive injuries to his sides. The charge against her was that she had stolen a coat belonging to Florrie Mayes, another Vauxhall employee, from the cloakroom. 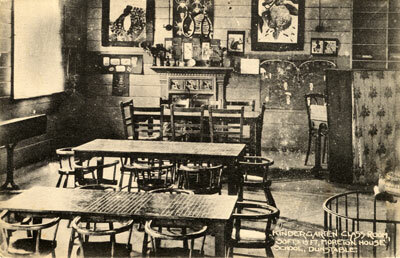 Hubert Bolton, the manager of the department, stated that on Thursday December 7th Mrs Clark had left without giving notice. On that day he had put up a notice in order to put an end to a series of thefts. Around 18 to 20 coats, many hats, and some money had gone missing. This had only occurred in the women’s department; there was no such trouble in the men’s. This pattern of thefts has been seen in many other large Works since they began to employ women. Some had taken on a woman to protect the girl clothes at considerable expense. The stolen coat was found by another girl employee who lived next door to Mrs Clark. When Mrs Clark became aware that it was known she had the coat she went home. She denied to the neighbour girl that she had stolen it, but when told “If you don’t bring it down Mr. Bolton is going to kick up a fuss about it” she fetched the coat. Mrs Clark was arrested and when asked to account for the coat claimed she had borrowed it. When it was pointed out that she had admitted stealing it she replied, “Well, I sent it back again”. In court she pleaded guilty and expressed her sorrow. When asked if she was hard up she said her husband only had a pension of £1. Mr Bolton had hoped that the Bench would make an example of Mrs Clark, but the Bench felt they could not do so due to her distressing circumstances. Although the court was told this was not her first offence and she had been prosecuted for stealing twice before, in October 1912 and May 1913, they decided to fine her only 10 shillings, with payment spread over a month. Mr Bolton admitted that Vauxhall had no idea about the extreme circumstances. 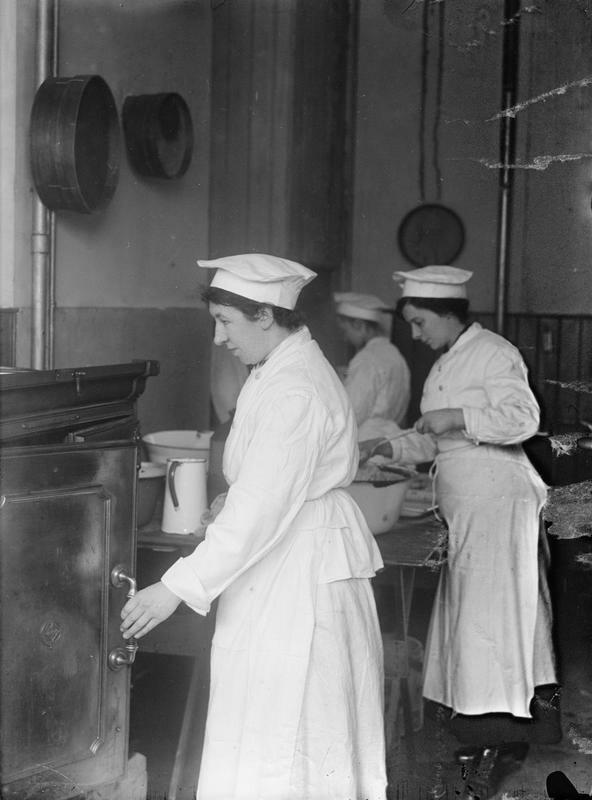 Tuesday 21st December 1915: To alleviate the labour shortage caused by the war the Post Office has taken on a number of postwomen. 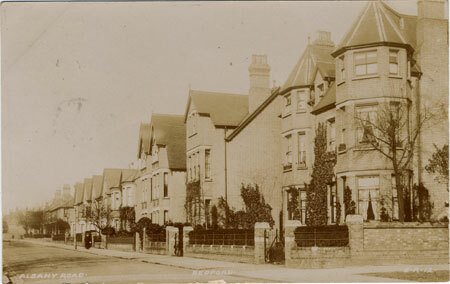 A reporter who spent time with a lady learning the ropes in New Bedford Road area of Luton tells us, “She walks along very briskly, and appeared quite a home with her bag and bundles of letters”. 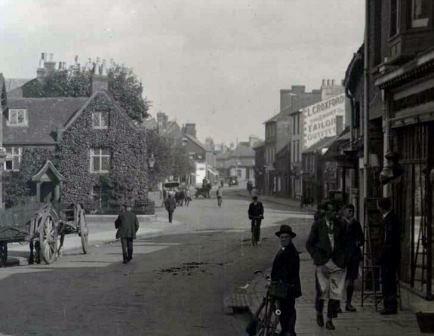 At Woburn Miss Ethel King has taken her brother’s place and in now delivering letters in the town. The mid-day delivery has been discontinued and the residents of Woburn are not only receiving two deliveries a day. A second postwoman, Miss May Skinner, is expected to begin deliveries imminently. 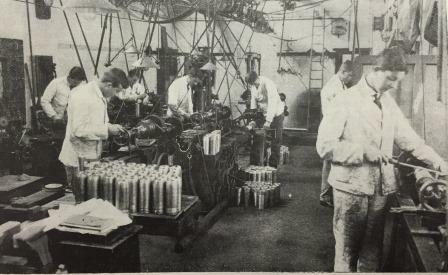 Monday 20th December 1915: The boys at Bedford School are contributing to the war effort by carrying out munitions work. Through the assistance of Mr. F. Yarrow at the end of the summer term the Headmaster was able to obtain from Yarrow’s about 50 high pressure valve bodies to be machined and 50 bolts and nuts for the casing of turbines for the Navy. During the summer holidays about 50 boys volunteered for this work, working in three shifts. Each shift of boys worked for 3½ hours every other day under the supervision of Mr. Davison; an extra shift of amateurs worked two afternoons each week. The task was completed early in the autumn term to the complete satisfaction of Messrs. Yarrow. Arrangements were also made with the South East Midlands Munitions Board to manufacture 13lb shells. Work has been carried out on these since the beginning of term by the boys and amateur works, to whose numbers some ladies have recently been added. A large number of boys have volunteered to work during the afternoons outside school time, and others to work during the Christmas holidays. Extra machinery has been required to manufacture the shells, with a large amount of preparation in the manufacture of gauges, chucks and special tools, only made possible by the skill and devostion of Mr. Davison. The gauges and chucks for some of the final operations are not yet complete so no shells have yet been finished. A large number are nearly complete, and nearly all have passed the tests so far applied to them by the Government Inspectors. Sunday 19th December 1915: Our military correspondent wrote recently of the young Biggleswade soldier Private Christopher Lincoln who was severely wounded in the thigh in September while performing an act of conspicuous bravery at the Battle of Loos and is now in hospital at Colchester. To show its appreciation for his actions the Biggleswade Chronicle set up the “Chronicle Heroes Fund” to raise funds to purchase a gold watch for the young man as a token of appreciation from the town. The scheme is supported by the Chairman of the Urban District Council who will make the presentation on behalf of the town if the scheme is a success. 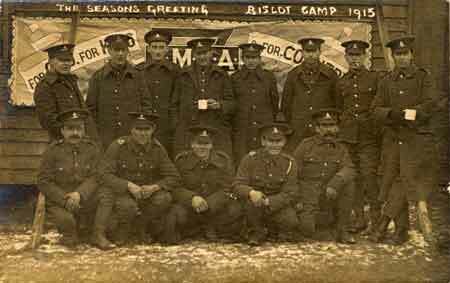 The 2,200 postcards which have been published to commemorate the young man's gallantry carry the words “With the Season’s Greetings” and can be used as Christmas and New Year’s cards. Boys and girls have been selling the cards and the number bought is already approaching 600. Gertie Jackson has raised 12s 4d and Winnie Dennis is not far behind with 9s 2d. The fund is also open for subscriptions. 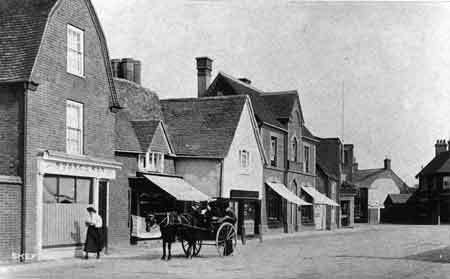 Saturday 18th December 1915: Thomas Poland, the postmaster of Aspley Guise, was brought before a special court at Fenny Stratford this morning and charged with stealing two diamond rings from a registered postal parcel which was in transit at Bletchley Central Post Office. On hearing the charge Mr. Poland stated “I am absolutely innocent of the crime”. 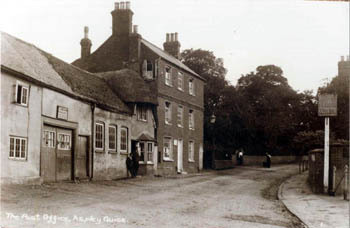 The accused, who is a married man and a property owner, had been a clerk and telegraphist at Bletchley and had only recently been promoted to the Aspley Guise postmastership. Bail was granted in the sum of £100 with two sureties of £50 each. Get to know what most they need, then give it to them – a practical gift in the firing line will be triumph for the giver and a joy to the recipient. Here are a few suggestions. We suggest Flannel Shirts, Pyjamas, Pants and Vests, Wool Socks, Fancy Cashmere ditto, Gloves, Neckwear, Collars, Braces, Motor Scarves, Mufflers, Handkerchiefs, Hats, Caps, Umbrellas, Raincoats, Macintoshes, Travelling Rugs, Dressing Gowns, Trouser Press and Stretchers, etc. For those who would prefer something other than clothing the advertisement of Horace Edward Herington M.P.S., Chemist, of 16 Market Square may be helpful. Any parcel packed free of charge for post in the United Kingdom. If packed in canvas for abroad a small charge made for canvas. Thursday 16th December 1915: Efforts are being made to revive the traditional Bedfordshire industry of lacemaking in line with the suggestion of Mrs. W. P. Gordon. At Maulden classes are being held both in the Day Schools and the Evening School, an innovation which is appreciated not just by the girls, but also by the teachers and parents. When baking potatoes, place them in hot water for 15 minutes before putting in the oven. They will then bake in half the time, and so effect a saving in gas. Keep a small box in the kitchen, and into this throw all used matches and ends of candles too small to burn. The contents of this box will be most useful for lighting fires. Vegetable peelings should be broken up small, wrapped in a piece of paper very tightly rolled and placed at the back of the stove sideways, on the top of the coals. The flames will scorch the paper black, and it will look like a lump of coal, will burn slowly, and be a great saving in fuel. Instead of using two eggs for the family cake, use half an egg beaten up in two tablespoonfuls of golden syrup. When making rice pudding, place a slice of bread in the bottom of the dish and use less rice. Stewed fruit will need less sugar if the fruit is put into a basin and steamed first, and the sugar and water boiled separately and then added to the fruit. Put a pinch of bi-carbonate of soda in the teapot when making tea, and you will save a quarter of a pound on each pound of tea. Scrape and wash half a pound of carrots, then put them into boiling water with salt and a piece of soda as large as a nut. Boil with the lid off, then rub the skin from them and pass through a sieve. Add a tablespoonful of sugar and two drops of lemon-juice. Make a custard with custard powder and add to the carrots, grease a pie dish and pour in the mixture. Place a few pieces of dripping on the top and bake for three-quarters of an hour. Turn out and serve. 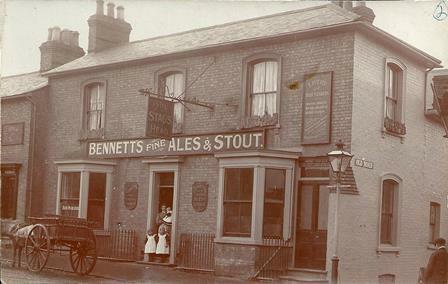 Monday 13th December 1915: The son of the landlord of the Swan at Bromham has been wounded for a second time. Corporal Jim Quenby was in a communication trench waste deep in mud so had to get on top to reach the firing line; while doing so he was shot through both thighs. Corporal Quenby was one of eight Bedford lands who joined the 6th Gordon Highlanders while they were billeted in Bedford. Within a couple of weeks of arriving in France they took part in the Battle of Neuve Chapelle where one of the Bedford lads was killed and four others wounded including Quenby. After eight weeks recuperating in hospital at Rouen he returned to the Front where he was the only Bedford boy left in the firing line. As an expert bomb thrower he has on occasion been in trenches only 15 yards from the enemy. Before he enlisted in October last year Corporal Quenby was a clerk in the finance department of Bedford Corporation. He is now being treated at the Lahore British General Hospital. His father has received a letter from the Chaplain stating that there has been a slight improvement in his condition. One Linslade family has certainly done its share in contributing to the defence of the country. Joseph Woolhead has become the sixth son of Joseph and Sarah Ann Woolhead of 48 Old Road to join the Forces. Joseph, who emigrated to Canada some years ago, has enlisted in the Canadian Field Artillery. His brothers Edward and Lewis are in the infantry, Ernest is attached to the Army Service Corps, and Albert and Walter are in the Navy. Saturday 11th December 1915: Today is the last day of a recruiting scheme introduced by the Director General of Recruiting, Edward Stanley, the 17th Earl of Derby, which has been in operation since the beginning of November. Using information from the National Register compiled earlier this year all eligible men aged 18 to 41 who are not in an essential occupation have been interviewed by canvassers and asked face-to-face whether they are prepared to join the Forces. Those who agree are obliged to go to the recruiting office within 48 hours. Once sworn in they are being placed in one of 46 groups. Each group will be summoned in order for active service, with each being given 14 days’ notice. All the groups of single men will be called up before those containing married men. The Corn Exchange at Luton has been a hive of activity this week with men rushing to sign up before the scheme closes. So many men have presented themselves to enlist that many have faced a wait of several hours. The pressure today is so great with hundreds of men from the big engineering works wishing to attest that it is feared the staff may not be able to deal with all the men by tonight. The rumour circulating in the town that the scheme would be extended is now known to be false. It is hoped that enough men will have been induced to enlist by this recruiting scheme that it will be possible for the Government to avoid introducing conscription. Thursday 9th December 1915: We often hear of the ladies of the Voluntary Aid Detachments but should remember that a number of men are also doing their part. 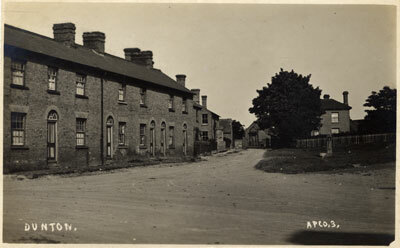 The men of the 1st section of Luton’s Red Cross are doing active work, attached for night duty to Wardown Hospital. One of the men attends the hospital every night ready to help as required. Messrs. Hayward-Tyler’s works formed this V.A.D. section some ten years ago. All the men are thoroughly experienced, with many holding merit medallions. 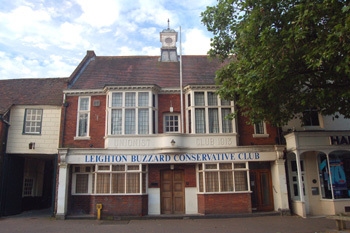 Their training has been carried out by Arthur Dines, the first section leader appointed in Bedfordshire. Hayward-Tyler have taken a keen interest in the men’s work and they are trained to proper military standard, as they demonstrated in the ambulance operations at the Territorial recruiting demonstration held at Luton Hoo. Much credit is due both to their leader and to the men who are prepared to give up much of their leisure time to carry out this important work. Wednesday 8th December 1915: The Bedfordshire Times has asked its readers to shop early for Christmas, saying “To ‘Shop Early’ is to show true patriotism and to practice the most certain economy.” This year shopkeepers are labouring under unprecedented difficulties. Labour shortages are affecting every aspect of the retail business – production of goods, delivery to and by the shops, and dealing with customers. While most businesses have managed to obtain good supplies it will not be easy to replace these once sold. For example, the toys hand made by the new British toy making industry cannot be produced in the same quantities as the cheap toys previously imported from Silesia. Deliveries are often held up by the uncertainties of the railway system, where goods services are being curtailed due to the shortage of staff. Shoppers are also being asked to shop earlier in the day. This would take the pressure off shop assistants, who often spend the first hour or two of the day with little to do and are then rushed off their feet for the rest of the day. If shopping could be finished early in the evening it would also make delivery much easier. Fortunately small purchases are now generally being carried home but heavier and bulkier items still need to be delivered. The lighting restrictions now in place make it very much easier and safer if the shop vans can start their rounds earlier. An anonymous Bedford shopkeeper has expressed his gratitude for this plea. Shopkeepers are finding it considerably harder to buy goods than to sell them. Seasonal parcels are often two or three months behind schedule, and goods handled in London or Manchester often take a fortnight to reach Bedford. If customers shop early as far as possible matters will run far more smoothly and it will be to their own advantage to obtain their Christmas wants well in advance. Monday 6th December 1915: Richard Hemmaway, a driver employed by the Great Northern Railway was killed today while driving a goods train from Peterborough to London. Christopher Maidens, the fireman on the train, said that all went well until the train was about a mile from Sandy, when Hemmaway got on to the tender. The train was travelling at about 20 to 25 mph when they passed under a footbridge at Low Field in Everton and he heard a crack. When he looked up he could not see Hemmaway. He climbed onto the tender step and saw the driver lying with his head against the lid of the tank. He stopped the train and whistled for the guard. On examining Hemmaway they found he was dead. 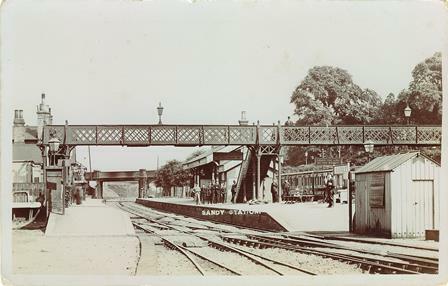 The driver knew the track well and Maidens thought that he must have gone to look in the tank to make doubly sure of the water – they could not get water at Sandy and would have to whistle for the slow line if they wanted to get water at Biggleswade. The guard, Patrick O’Connell said that when they found the driver lying dead on the top of the tender they went on to Sandy as quickly as possible and placed him in a waiting room. There he was examined by a doctor who found a fracture to the upper part of the cervical spine and two lacerations at the back of the scalp. Death must have been instantaneous. Richard Hemmaway was a married man with five children; he was 49 years old and lived at New England, Peterborough. He had worked for the Great Northern Railway for over 30 years been a driver for nine. This was the second rail accident at Sandy in just three days. On Saturday Private Frank Reynolds of the Norfolk National Reserve Regiment who are stationed at Sandy was carrying water across the London and North-Western Railway Bridge over the Great Northern Railway in Cambridge Road, Sandy, when a train due to arrive at Sandy at 9.07 a.m. overtook him before he reached the south end of the bridge, catching him on his right arm. A doctor was summoned and found his arm to be badly cut and bruised He was taken to the Red Cross Hospital at Beeston where he is making good progress. Sunday 5th December 1915: The 9th Bedfordshire (Biggleswade) Troop of Boy Scouts attended a special service at Biggleswade Parish Church this afternoon at which a collection was taken in aid of the Boy Scouts Motor Ambulance Fund. The Troop paraded at Headquarters before marching with the band via Hitchin Street, High Street, Sun Street, and Shortmead Street to the Church. Much amusement was caused when in Shortmead Street the marching scouts overtook a piebald cow. She halted in the centre of the road, considered the Scouts, then turned and set off at the head of the Troop, swishing her tail like a Drum-Major’s staff. She marched sedately at the front until she reached the Girls’ Church of England Schools where she chased some schoolchildren down a nearby lane. The Troop’s Chaplain Reverend G. C. Rolfe preached on the subjects of “Progress and advance”. The boys were told “People … are looking for the Scouts to set the tone of what an English boy ought to be. God wants you to be true English Christian boys. That does not mean that you are be dismal and have no pleasure, but that you should be the happiest boys in the world”. After the service the boys were addressed by Lord St. John, the Chief Scout of Bedfordshire who told them it was always a pleasure to come to Biggleswade and that it was a pleasure to see the troop looking so smart. He urged the boys to obey the Scout laws in crossing the river of life. The Scouts then marched back to Headquarters where they were dismissed. It is hoped that some of the young lads who hang around the streets or lounge in the Picture Palaces everything would set aside two nights a week to join the “Scout boys”. There are several vacancies in the ranks for boys aged 11 to 18; any who wish to join should apply to the Scoutmaster. A collection was made during the week ending November 13th for the National Million Shilling Fund for the Belgian Army. This raised a total of £5, very considerably more than the £2 the village had been asked to contribute. The scheme was to raise a million shillings to provide comforts of food and clothing to the entire Belgian Army as well as necessities such as field kitchens, sterilizers and trench heaters. Miss Miller has now collected over 1,000 eggs for the sick and wounded. Many have been sent to base Hospitals in France. Percy Parrish, from whom we first heard in January, has written to his mother describing how his brother Cyril has been wounded: “I went down and saw his (Cyril’s) Captain and he told me all about it, he was hit about 3 o’clock in the morning while on guard in the trenches, and the Captain said he was the best bit of stuff he had seen, we can well be proud of him; and he gave over his orders as if nothing had happened, and told the boys he was just going for a holiday, and he would be back in a month or two, and have another go”. Mrs Arnold of Greenfield is grieving the sad loss of her husband Omar, who was killed when his ship was in collision with another in the Aegean Sea. “He was a good man and his heart was turned to God”. The Day School children are busy preparing to give a concert in the New Council Schools on December 10th. 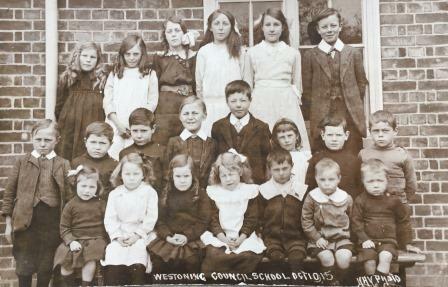 The aim is to provide comforts for Westoning men at the Front. The Sunday School children have agreed to the suggestion that they should forego their Christmas treat and the money saved be added to the amount raised. The parish congratulates Colonel Lumley Jones on his appointment as Brigadier General. As he began the war with the rank of Captain, his promotion has been extraordinarily rapid. A concert given at Clophill by violinist Monsieur de Reyghere and his concert party has raised nearly £5 for the Belgian Relief Fund. Belgian badges were distributed during the interval and a collection made on behalf of Belgian soldiers which realised £1 7s 0d. M. de Reyghere has committed himself to giving a hundred concerts for this cause and has already performed more than sixty. Mr and Mrs James Sharman have lost their baby James to whooping cough. There have been a number of bad cases during the epidemic which caused the closure of the school last month, but this was the only death.